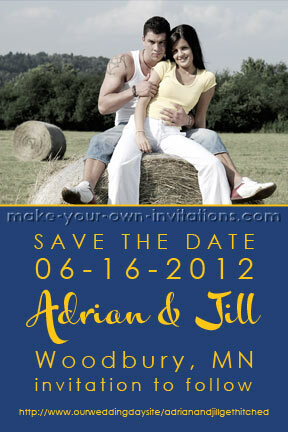 This semi-formal save the date card can be designed in your wedding colors or colors to accent your photo. It is pictured here in a deep shade of blue with the card wording a bold solid yellow. The text stands out beutifully against the blue background. The top half of the card is covered with your engagement photo. This can be left in its original color or it can be converted to black and white, sepia or a vintage tint like in this sample. Send us your photo and your wedding information and we will create a digital save the date card for you to print and send to your guests. This design is available as a 4x6" or 5x7" JPEG file that you download and print at your leisure. Print as few or as many copies as you like.